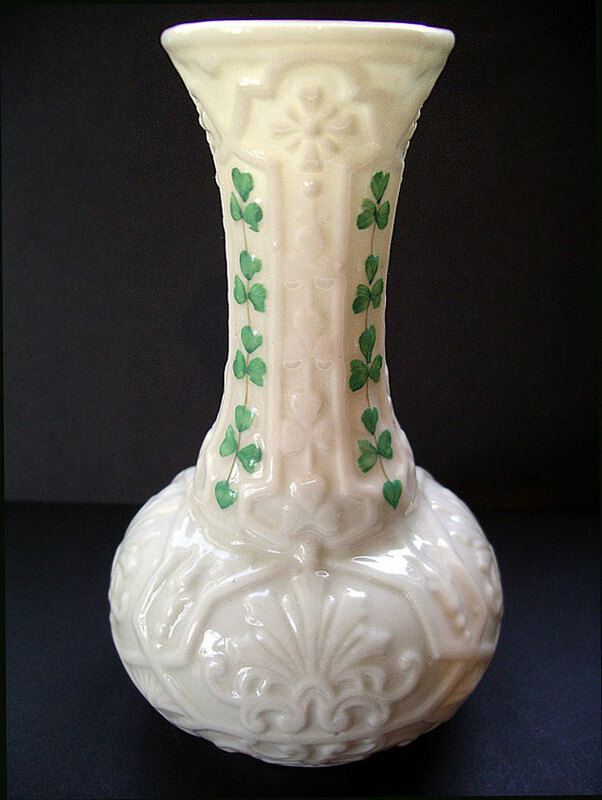 "A stylish, rare, Irish Belleek Second Black Mark Shamrock pattern Onion shaped flower spill vase made between 1891 and 1926. This is a great decorative design and always popular. This is a good display example with particularly crisp moulding to the raised relief decoration - as found on the earlier pieces." Antiques Expert Hamilton Bear. Dimensions: height 135 mm max. width 82 mm max. Marks: Second Black Mark printed to base (illustrated). Condition: In excellent condition for dis[play. 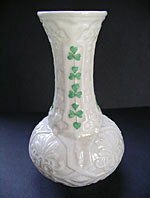 There is a tiny chip to rim and associated tight fine hairline to one side of the vase which is difficult to spot. 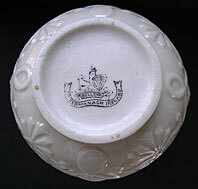 A second shorter faint hairline is visible inside the rim when viewed from the top. There is no restoration and the piece is sound. A good surviving early example of this great design.